The fisheries issue is one of the sticking points in securing a final Brexit deal. A flotilla of fishing boats leave South Shield Fish Quay near Newcastle. THERE ARE CONCERNS among Irish fishermen that the fish sector could be left out of the EU-UK customs arrangement currently on the table as negotiators try to avoid a no-deal Brexit. Up until this week, a no-deal has seemed increasingly likely, as the UK and EU couldn’t agree to a backstop that would both satisfy the UK’s desire for sovereignty, and avoid a hard border on the island of Ireland. But now, it looks as though a compromise has been drafted in the form of a UK-wide customs arrangement, which would be “a first cousin” of the Customs Union. In the draft deal published last night, there aren’t new provisions made for fisheries, and will remain under EU rules “…unless an agreement on access to waters and fishing opportunities is applicable between the Union and the United Kingdom”. In accordance with Article 184 of the Withdrawal Agreement, the Union and the United Kingdom shall use their best endeavours to conclude and ratify such an agreement before 1 July 2020. Sinn Féin Senator Pádraig Mac Lochlainn, who represents fishing communities in Donegal, said that “fishing waters are part of the negotiation chips, to be crude about it”. The UK has announced it wants to “take back” its waters as part of Brexit: this includes leaving the Customs Union and the London Fisheries Convention 1964 (an arrangement incorporated into the EU Common Fisheries Policy). The London Fisheries Convention allows other EU countries to fish in the 6-12 nautical mile zone off the coast of countries, and allows neighbouring countries to fish in the 0-6 mile zone (such as Northern Ireland and the Republic). More than 50% of fish that have been caught in UK waters are by non-UK vessels last year. This is mirrored in Ireland, says Conor McCourt, a spokesperson for the Foyle Fisheries Co-Op. located in Greencastle on the edge of Lough Foyle. More than half of our fishing is done in UK waters, there’s not really fishing in Lough Foyle other than oysters – it’s an absolute doomsday scenario if EU boats are prevented from fishing in UK waters. “The UK import most of what they eat, and export most of what they catch,” McCourt says, adding that the UK exports a huge portion of its fish to EU member states. For that reason, McCourt isn’t too pessimistic about what the final arrangement will be - “It’s probably going to be a Brexit deal close to what’s in existence now” – but adds there’s still too much uncertainty at the moment to be sure. Mac Lochlainn says that if the Brexit deal ends up in the “nuclear option” and Irish fishermen have no access to UK waters, it would be “disastrous” in the context of the existing state of play. The industry would have to be compensated by the EU, he says. Speaking during Prime Minister’s Questions yesterday, May said that the UK would “take back control of our borders, our laws and our money, leave the Common Fisheries Policy and agricultural policy while protecting jobs, security and the integrity of our United Kingdom”. Ahead of a Cabinet meeting, a letter from 13 Scottish Tory MPs including the Scottish Secretary of State, was hand delivered to May warning against supporting a deal that didn’t protect fishing rights. They said that fishermen didn’t want to be in the Common Fisheries Policy beyond 2020. McCourt says that his understanding is that nothing is agreed on the catching side or selling side of fisheries yet, and adds that “one of the UK’s strongest cards is fisheries”. “We’re wondering if Brexit is ever going to happen, up until this week we didn’t think it was,” he says. 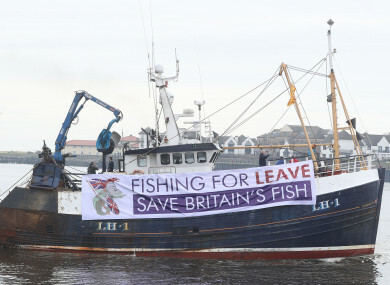 There’s great concern among fishermen that if the UK leave, it will have the power to decide who can fish on its shores and to control how much they catch. The highest value fish is mackerel, according to McCourt. Although you can catch it off Irish coasts, most mackerel is caught in Scotland because it has the right oil content at this stage of its life. “There’s a big fear for the mackerel industry if they can’t access UK waters. The UK also has prawn fishery beds in the south east – that’s also concerning. But it’s across the board [for all fishermen, fishing all fish]. And if the UK leaves with no deal and the price of 50% of their fish rises, what will they do? From Day One that’s going to be a problem, but there’s very little we can do – prices are just market driven. Email “'UK's strongest card is fisheries': Fish sector could be left out of Brexit customs deal”. Feedback on “'UK's strongest card is fisheries': Fish sector could be left out of Brexit customs deal”.